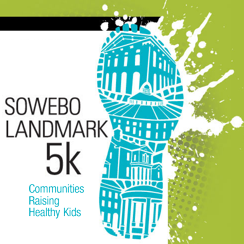 The Sowebo Landmark 5k Run/Walk aims to unite neighbors, families, schools, and local resources to empower our youth to be active, eat well, and lead healthy lives. Union Square residents have joined with the Chesapeake Center for Youth Development (CCYD) and the Southwest Baltimore Charter School (SBCS) to stand up and take action. The route starts at Historic Hollins Market, continues to the B&O Railroad Museum grounds, down through Pigtown to Carroll Park, and enters the park and loops up and around the Carroll Park Mansion. The route continues to Southwest Baltimore Charter School and ends at Historic Union Square Park, where the H. L. Mencken house is located. The finish line area at Union Square Park will include post-race refreshments for all runners, a kid's fun run, and a community health fair. Onsite race day registration is $30 and runs from 7:30-8:30 AM - Sunday, October 2. Sowebo Landmark 5K T-shirts will be provided to all 5K participants. Several awards will be given out for both the 5K and the Kid's Fun Run. There will be a post-race celebration with food and beverages provided. No dogs, skateboards, rollerblades/rollerskates, or scooters are allowed on the course.